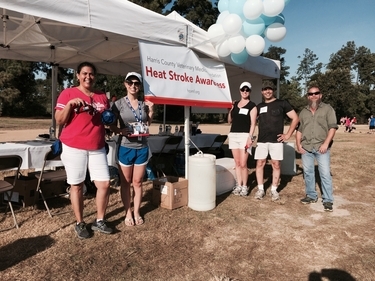 Please join us in Memorial Park near the tennis courts for our 4th heatstroke awareness event! We will be handing out information on how to keep your pets safe in the Houston heat and also giving out some free pet items and water to all who stop by. We will be there all morning (7am-2pm) - please join us! The History of the HCVMF: In 1991, veterinarians throughout Houston united to form the Harris County Veterinary Medical Foundation (HCVMF), a nonprofit organization dedicated to building a better, healthier world for pets. Today, with the help of many committed volunteers, the HCVMF serves as one of Houston's most successful groups actively educating the public about responsible pet care. Veterinarians and others interested in the well-being of pets operate the HCVMF. They raise money and coordinate community education programs, focusing on important health issues such as pet overpopulation, heartworm disease, proper dental care, geriatric pet health care, and disaster preparedness. A majority of the money raised by this 501(c)3 charitable organization funds educational campaigns and scholarships for students pursuing careers as veterinarians or veterinary technicians. The operating expenses are minimal and require little of the foundation's funds. The HCVMF journey to improve animal health and welfare will continue well into the future thanks to the efforts of its many supporters. HCVMF appreciates donations of any size and welcomes volunteers. We're delighted to have this means of sharing information about caring for the animals that enrich our lives. To learn more about how you can contribute, click on the Donate link.